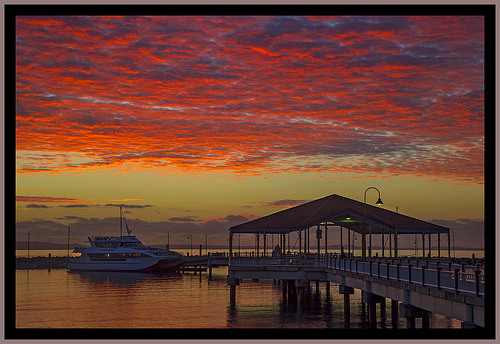 Dawn Over Redcliffe Jetty (3) by Sheba_Also on Flickr. Some rights reserved. On most days of the week, I am the first person up in our household. My alarm clock rudely interrupts my sleep, I switch it off and lie in bed for as long as I think I can get away with, before coming down, unlocking the front door, opening the curtains, feeding the cats and making drinks for everyone. It doesn’t come naturally – I am constitutionally a late night person and am also usually the last to bed as well as the first up. As Paul gets us to prepare for the second coming of Jesus Christ in Romans 13, he gives us an image of the early morning. He gives us three images of preparing for the day that help us know how to live in the light of the fact that Christ will appear again one day. The first question is, what time is it? As you may know, a hobby I enjoy is photography. One of the most important factors to consider as a photographer is the light. Some people think that the bright light of the middle of the day is the best light for taking pictures, but to many of us it isn’t. It is harsh, and it causes dark, unforgiving shadows. No: light is better at the beginning or the end of the day. The times around sunrise and sunset are the most interesting. And just as we speak about there being twilight around sunset, so there is also twilight around sunrise. In fact, as I learned from reading an article the other day, there are three phases of twilight just before the sun rises. There is astronomical twilight, when the centre of the sun is twelve to eighteen degrees below the horizon, and the light is dark blue – even still seeming like darkness. Then comes nautical twilight, when the sun’s centre is now between six and twelve degrees below the horizon. Orange and yellow hues join the dark blue. Finally, there is civil twilight, when the centre of the sun moves between six degrees below the horizon to sunrise proper itself. Now the light is a mixture of pale yellow, neon red and bright orange. Only after that is sunrise itself, and the first hour afterwards is called the ‘golden hour’, because red light turns gold at this time. Why am I telling you all this? Because Paul tells us that we are living between twilight and sunrise. If you remember the stories in the Gospels about the Resurrection of Jesus, you will recall that it happened in the early morning, before the dawn. Paul effectively says that as we now live in between the Resurrection of Jesus and the Second Coming, when all will be raised from the dead and God’s light will shine everywhere without opposition, we live in between first twilight and sunrise. We live now at a time when the light has begun to come but the darkness is still around. However, the longer time goes on, the closer we get to the full sunrise, when darkness will flee away at the full brilliance of the sun. So next time you are discouraged, remember everything to do with Jesus. He came as the light of the world, and the darkness couldn’t cope with him. Darkness thought it had got rid of him on Good Friday, but in the morning twilight of Easter Day we learned that wasn’t true. Now we are waiting for the sunrise. We may be tempted to think it’s pointless doing the right thing, because evil seems to be rampant, but living between the Resurrection and the Second Coming means that it is always worth aligning ourselves with what is good, beautiful and true. Be encouraged by the breaking of the dawn. The second question is, what shall we wear? The alarm clock has woken you. A good supply of tea or coffee, pumped intravenously into you, has got you going. A shower has brought you closer to full humanity, and now you must decide what clothes to put on. How will you face the world today? Paul has two images concerning this in the passage: ‘put on the armour of light’ (verse 12b) and ‘put on the Lord Jesus Christ’ (verse 14a). So – two sets of clothes! Let’s think about each set. We should not forget that “quarrelling and jealousy” are put on exactly the same level as immorality; there are many churches where the first four sins [revelling, drunkenness, debauchery and licentiousness] are unheard of but the last two [quarrelling and jealousy] run riot. The church infested with quarrelling and jealousy might just as well be the one that is rife with sexual scandal and drug abuse, in the eyes of the apostle. Think about it. When we let our tongues behave loosely in our conversation before or after the service, we are a deeply immoral church, filled with darkness. We must protect ourselves against this by wearing armour – the armour of light. What does that mean? I suggest it involves disciplined efforts with the help of the Holy Spirit to concentrate our minds and our affections upon all that is good, worthy and noble. We resist and we cut down the attempts to infiltrate our minds with darkness. This requires filling ourselves with all that is good, starting with the Scriptures. It involves building our lives around the Gospel and all that it implies – the undeserved grace of God, his sacrificial love in Jesus Christ, the power of the Holy Spirit, the benefits of peace with God and others, and so on. Frequently when Paul uses more than one name or title for Jesus the one he wishes to emphasize is placed first; here, by saying, “put on the Lord Jesus Christ”, he seems to be drawing attention to the sovereignty of Jesus, not simply over the believer (who is bound to obey the one whose servant he or she is), but perhaps more particularly over the forces of evil that are ranged against the gospel and those who embrace it. … The assumption must be that he is urging them, as a regular spiritual discipline, to invoke the presence and power of Jesus as Lord of all things to be their defense against all evil, not least the evil toward which they might be lured by their own “flesh”. Jesus, then, has power over the evil that threatens us, and when we are tempted to give way to the darkness that denies the coming of the light, we invoke him, we call upon him and are then able to resist and align ourselves with the breaking of the dawn rather than the powers of the night. The NIV speaks about us not thinking about how to gratify the flesh. It’s about excluding appointment requests from our diary, not including. I usually look at my diary for the day and consider what is in there. It affects decisions I make during the day about what things can claim my time. I try to check my diary carefully when I receive requests for appointments in the future, too. Do I have too many demands on a particular day? Does this fit with what a minister should be doing? Why does this request appeal to me, and is that for good reasons or selfish ones? Why does this next request not appeal to me? Is that for good reasons or selfish? Likewise, we have influences who want to take up our time in life, and our decisions on who and what we will give time to may well affect how much we align ourselves with the coming daylight of our King. Paul knows that one way in which we end up making wrong, sinful choices is when we give over our time to things which play on our own self-centred desires. Sometimes it’s the casual way we allow ourselves to idle time away, thinking casually about things that then start to take a hold on our minds, until eventually we end up thinking, doing or perhaps saying things contrary to our faith, and which bring us a deep sense of shame. You can see this in Bible stories like that of David and Bathsheba. David was supposed to be leading Israel’s army in battle, but he gazed at Bathsheba bathing naked on a nearby roof. Why she used her time to bathe like that where she would be seen from the palace is also questionable. We know the horrifying results. David so wants Bathsheba that he arranges the death of her husband in battle. She becomes pregnant, and they lose the baby. Now that may be the furthest thing from your mind, but think of how we allow the agenda of advertisers to dominate our thinking until we are dissatisfied with things that previously contented us. We then end up exercising poor stewardship of our money. What about when we give our time over to entertaining gossip? Or how about the occasions when we allow our thoughts to be inflamed by the sly prejudices of certain politicians, journalists or television commentators? No: if we are dressed in the armour of light and we have put on Jesus Christ as Lord, we cannot imagine that we are going into a bright day where there will be room in our schedules for those things which seem harmless but which grow from tiny specks to great swathes of darkness. Advent Sunday is a time to remember that the light has been breaking through, especially since the Resurrection of Jesus, and today’s twilight will soon become the glorious dawn of his second appearing. May we live, knowing what time it is. ‘Romans’, New Interpreter’s Bible Volume X, p 729. I received my subscription copy of Christianity magazine yesterday, complete with the now infamous interview with Mark Driscoll, about which I wrote on Friday. In addition to the well-publicised insults to British Christian ministers, a couple more things took my breath away. But more, he then goes on to the Second Coming and says that the purpose of Jesus coming again is precisely so that he can ‘give a beating’. Well – yes, Jesus will judge and condemn sin, there will be eternal punishment for the unrepentant (although I disagree with him that it is an eternal, conscious torment – that doesn’t take apocalyptic language seriously). But to frame it in terms of Jesus coming to give people a beating is not going to put the right kind of fear of God into people, is it? The second observation I had is where Driscoll refers to those who do not believe in penal substitution. Now let me make it clear that I believe in substitutionary atonement, but I am aware of the dangers in how it is framed and explained. I want nothing to do with those in the ‘Young, Restless and Reformed’ camp who explicitly talk of the Cross as a place where God killed Jesus. That says it all about the worst of this teaching. However, what made my jaw head for the Southern Hemisphere was Driscoll’s supposed reason for why people reject penal substitution. Is it about concepts of justice or love? No! People reject it because – wait for it – it’s too … masculine. You may know that my ‘claim to fame’ is that I studied Theology under George Carey, and that he was one of my referees when I candidated for the Methodist ministry. When George left the world of theological colleges to become Bishop of Bath and Wells, he was soon asked to be present at the reopening of a post office in Wells. The reopening was scheduled for Ascension Day. George discovered that the organisers wanted to mark the reopening happening on Ascension Day by him going up in a hot air balloon while people sang the hymn, ‘Nearer my God to thee’! The story of Jesus’ ascension is a problem for us. Developing knowledge of astronomy over the centuries has meant that it is difficult to believe that geographically heaven is ‘up there’ and hell is ‘down below’. Despite the fact that Christians have long since abandoned such over-literal interpretations, you may recall how in the 1960s the Soviet leader Nikita Khrushchev said that [Yuri] “Gagarin flew into space, but didn’t see any God there”. So we might think that the doctrine of the Ascension is worth rejecting. But in response to that we might say, how else do we know that Jesus Christ is reigning in the universe? If he didn’t return to his Father’s side, what did happen to him? If he returned to heaven in a different way without dying, how did he do so? Might we have in the story of Jesus’ Ascension what is sometimes called a ‘miracle of accommodation’? In other words, Jesus accommodates himself to the limited understanding of his followers by the miracle of rising into the clouds as the only way they would have understood that he was returning to his Father’s presence. In that sense, it’s similar to the creation stories – we’re not meant to take them literally, but they are written in the language of the creation stories of their day. So if at the Ascension Jesus shows the disciples in their limited understanding that he is reigning at the Father’s right hand, what might he teach them – and us, too, with our limited understanding – through this event? I believe he has something to tell us about the church. I want to share ‘Three ‘W’s’ about the church that we see in the light of Jesus’ Ascension. He goes on to show that that ‘promise of the Father’ is the gift of the Holy Spirit. At first, you might think this is not relevant to us, because since Pentecost Christians don’t have to wait for the Holy Spirit. When we turn from our sins and put our faith in Christ, we receive the gift of the Spirit. It’s something that society does to religious faith and practice, too. Our great annual season of waiting, Advent, is crushed by the unwillingness to wait for Christmas. We are infected by the disease of impatience. We expect instant solutions to deep problems. One application of something that ‘works’ elsewhere and we think the tribulations of the church will be solved. But God calls us to be a waiting church. The best things take time. They take God’s time, and come in God’s timing. We know it is unwise to give children everything they want, and especially at the moment they request it. So it is between God and us, too. He has wise reasons as a loving parent for making us wait, even for good things. In particular, I suggest that one reason he keeps us waiting is that he wants to develop character in us. If we received all we asked for instantly, we would love God for the gifts rather than loving him for who he is. Sadly, too many of us in churches are infatuated with the blessings rather than the One who blesses. We want what we can get out of God, rather than to follow him and love him in Jesus Christ. So God makes us wait. Holy waiting purifies our motives and focuses our hearts. We grow in grace and become more tuned into the purposes of God, rather than the lusts of our hearts. Our willingness to wait is a mark of true discipleship. And that is what the church is meant to be: a group of disciples, those who are learning the ways of Christ. Waiting puts us in a position where we learn Christ. Is that what we want? If it is, let us accept the grace of waiting. Make no mistake, the Ascension leads to Pentecost. In fact, Easter leads to Pentecost. With Pentecost comes the gift of the Holy Spirit. And with the gift of the Spirit comes the promise that we shall be witnesses. In particular, the witness that happens starts from where we are and moves outwards. Just as the disciples were in Jerusalem when they received the Holy Spirit, so their witness began there but it didn’t end there. It went to Judea, Samaria and the ends of the earth. Their witness may have begun with the people with whom they were most familiar, but gradually the Spirit drove them further from their comfort zones to be witnesses to Jesus Christ. The Holy Spirit does the same today. We make a grave mistake when we think witness is about us staying where we are and waiting for people to be attracted to us. That’s actually a cop-out from being witnesses to Christ, and thus cannot be a work of the Holy Spirit. No. Instead of the idea that we attract people to us while we sit comfortably (or uncomfortably) in our pews, the Holy Spirit sends us out from the place that suits us to the world as the witnesses of Jesus. The word is not ‘come’ but ‘go’. A witnessing church asks, how are we going into the community and beyond, carrying the love of God in Christ? Similarly, a witnessing church does not say, how can we attract enough people into this congregation so that it survives for another generation? It won’t say that, because that is a selfish question, more concerned with personal preservation than the Gospel. Jesus said that those who wanted to save their lives would lose it. Those who lose their lives for his sake and the Gospel’s will save their lives. So a witnessing church, filled with the Holy Spirit, says, the love of God in Christ is such a beautiful gift. Where are the people who need that love? And in the waiting time of Ascension, a true church is consumed with that vision of witness that its members plan how to move out from the church base, spreading God’s redeeming love in Christ to people in spiritual need, material need and social and emotional need. If this happens, then the church will meet as much as she needs for worship, fellowship and discipleship – but no more. It will not simply become the centre of our social lives, but the refuelling station as we venture into the world, filled with the Holy Spirit. Our social lives will more likely be fulfilled in the world as we network with friends who do not yet know how much Jesus Christ loves them. At Ascension-tide, then, the church anticipates this mission. We allow this mission to be the organising principle of church life. And we long for the equipping power of the Holy Spirit in order to put it into practice. The third and final characteristic of the church at Ascension (at least in this sermon) is that she is a watching church. This last week I went to the races. Sandown Park, to be precise. I go once a year. Before you think I have a gambling problem, let me explain that it was to attend the annual Christian Resources Exhibition. I was helping to staff the Essex Christian Healing Trust stall, but also found an hour or two spare to look around for myself, buy presents for the family and new clerical shirts for myself. When I was trying to hunt down a gift for Debbie, I was accosted by one stallholder who wanted me to know that his organisation had collected together all the scriptures about the Second Coming and it was their sole aim of their charity to make known what they saw as the truth on this subject. I took their leaflet and hurried on. Similarly, it was only the other day that one churchgoer told me how a relative lectured him for twenty minutes about the imminence of Christ’s Second Coming. Hence many of us become nervous of the fervent, if not extreme Christians who go overboard on this theme. We tend to think they’ve consumed too much fruitcake. And that’s before we get to the sects and the cults with their bizarre readings of Holy Writ. Nevertheless, we are to watch for the coming of Christ. Not in a standing-around-waiting posture, for which the men in white robes seem to censure the disciples here. Just doing that achieves nothing. The doctrine of Christ’s return was never meant to reduce us to inactivity and inertia. Quite the opposite, in fact. When we look for the coming of Christ, we are anticipating the fullness of God’s kingdom, the new creation in which God will bring into being the new heavens and the new earth. What does that mean? If we are filled with hope because Christ is returning, then while that may give us inner peace, it also gives us holy restlessness. We want to see the kingdom of God, so we get on with building for it. We call people to follow Jesus. We bring relief to the poor, and seek to change all that puts them in poverty. We bring God’s healing to the sick. We look after the creation that God is going to renew. Such a church is vibrant internally and externally. Internally, it is a forgiving, loving and safe place to be, where the only fear is awe at the presence of God’s holiness, not a worry that people have to tread on eggshells in the presence of bullies. Externally, it is known as a people who would be missed by the community if they folded, who champion the poor, and who have a winsome but challenging word for the world. Let me ask, then, whether we are a church of the Ascension. Are we willing to wait, so that God may form us more in the image of Christ? Are we witnesses, replacing the idolatry of church as social club with church as fuelling station for sorties of love into the world? And are we watching for Christ’s return, aligning our life and witness by the shape of his coming kingdom? Too often in the Methodist tradition we ignore the Ascension. O that we embraced it and let it shape us. Those of you who came to the recent demonstration of the Digital Hymnal may remember me using those words. David, the minister of Hutton and Shenfield Union Church, brought the equipment to show us what it could do. I knew David through Internet connections – Facebook, Twitter and his blog. But before that evening we had never met. I had seen photos of him, I knew what his work was and had some idea of his interests. But I had never actually met him. On Advent Sunday, we think in similar terms about Jesus. We know him, but we have never met him face to face. Yet on Advent Sunday, our thoughts traditionally go not to his first coming in the Incarnation but his ‘second coming’ – although the expression ‘second coming’ is not a biblical one. The main Greek words used in the New Testament mean his ‘appearing’ or his ‘royal presence’. Right now he is hidden from us and we know him from the Scriptures, the internal witness of the Holy Spirit, the sacraments and what we see of his work in others and in creation, but we have not seen him. Advent Sunday is when we look forward to seeing him when he appears. So we turn to these words in Luke 21, a chapter where Jesus addresses all sorts of world-changing events – the Resurrection, the coming fall of Jerusalem in AD 70 and the ‘second coming’ – or, if you prefer, ‘the appearing of his royal presence’. What does Jesus say to his followers? Is this a weather forecast? No. you don’t expect these verses to be followed by someone saying, “And tomorrow will be windy with scattered showers.” Rather, various Old Testament prophets referred to the ‘Day of the Lord’ having cosmic portents involving the sun, moon and stars – there are echoes here of Isaiah, Ezekiel and Joel. So is it a sign of the Last Judgment? You might think so when you read about ‘the Son of Man coming in a cloud’ with great power and glory: that fits our stereotypes about Christ’s return. Except … it’s a quotation from Daniel 7, and the context is one of vindication after suffering. Which makes the more likely context here not the Second Coming but the Resurrection. So – the Resurrection of Jesus is a sign of the Second Coming. Why? Because the Resurrection was the first evidence of God making all things new. Jesus received his resurrection body, just as others will at the End. What does that mean for us? It means that in the Resurrection we already have the guarantee that God will renew creation and bring justice. The Resurrection is what the New Testament calls the ‘first fruits’ – it’s the harvest that happened in late Spring which reassured people the main harvest would come at the end of the summer. For us, then, the Resurrection means we know Jesus will appear again, and God will put right all that is broken and that contradicts his will. Because we are Easter people, we are also Advent people. When I was a teenage Christian, I discovered the music of an American Christian singer called Randy Stonehill. The last song on one of his albums was called ‘Good News’. I expected a song called ‘Good News’ to be about the Cross, but it was about the Second Coming. ‘Good news, Christ is returning,’ sang Stonehill. And now I think he was right. The coming of Christ is good news, because it means all will be well. And we believe that because we have the sign of the Resurrection. So when injustice prevails, remember Jesus is risen and will come again. When suffering overwhelms, remember Jesus is risen and is returning. This is a doctrine of hope for the Christian. I have two problems with this story: firstly I am no gardener, and secondly I don’t like figs. However, it is clear even to a garden-phobic, fig-hating person like me that there is a simple principle at work in this parable. When a tree sprouts leaves, you know what is coming: it is certain. What does that mean for the followers of Jesus? I think it means this: the purposes of God are certain. When God sets out to accomplish his great plans for creation and for humanity, they will be fulfilled. I am not suggesting that God dictates everything and that we are mere pawns, nor do I believe that our every action is predestined. What I believe is simply this: that God has free will and we have free will, but God’s power means he has more free will than us, and he uses it to further his purposes of salvation. As the fig tree sprouts and later summer comes, so God speaks and his words do not pass away. How do we respond to this parable? In rather similar ways to the sign of the Resurrection. We respond with hope and with humble confidence. We put our lives in the hands of the God who promises to work for good in all things with those who love him, those who are called according to his purpose (Romans 8:28). What is the essence of this exhortation? To me, it is a call to a disciplined life. ‘Be on guard,’ says Jesus. Don’t have a lifestyle of dissipation and drunkenness. ‘Be alert.’ These are the watchwords of lives with a focus, a focus on Christ, and therefore matched with a discipline to keep that focussed concentration on him and not on sin or a casual approach to life. The watching and alertness are not about working out exactly when Jesus will return, but about keeping our eyes fixed on him in our lives. So the way to prepare for the coming of Christ is not to work out a celestial timetable, but to concentrate our efforts on doing what pleases him. We do that in contrast to a lifestyle of ‘dissipation and drunkenness and the worries of this life’, as Jesus puts it – which remains a very contemporary challenge. The temptation to ‘dissipation’ or self-indulgence is all around us, but Jesus calls us to self-discipline and self-denial. The life of the world to come will not be a hairshirt one, but it will be one where joy and pleasure are based not on what I get, but on what I give. So let’s get in tune with it now. The temptation to ‘drunkenness’ is not merely about alcohol, but about addiction to all sorts of things from drugs to food to shopping to relationships. Often our addictions mask pain in other areas of our lives, but Jesus calls us to face that pain and find healing with him. Then we can let go of damaging habits and live a life that anticipates the healing found in God’s kingdom. As for ‘the worries of this life’, our whole consumer society is based on feeding those worries. It isn’t that Christians can’t enjoy good things, but an obsession with them is counter again to the values of God’s kingdom, where true riches are found in other things, notably the fruit of the Spirit as God renews people to be more like his Son. Those are what the Christian will chase. So in conclusion, Advent is a time of hope for the Christian. As we recall Christ’s first coming and anticipate his appearing again, God’s action in the Resurrection gives a certainty to our hope. His purposes of love are certain and we are in his hands. That means we respond by reordering our lives according to the purposes of his kingdom, which means living distinctive lives –counter-cultural lives. May the hope of Christ’s coming give us the passion to do so. Tom Wright, Surprised By Hope, chapter 8. Fifteenth video from Damaris Trust. Anna Robbins on when and how Jesus is coming back. Fourteenth Advent video from Damaris Trust. When is Jesus coming back? Philip Yancey on how we should interpret prophecy. Eleventh Advent video from Damaris Trust. Tony Watkins on what we can look forward to when Jesus returns. Tenth Advent video from Damaris Trust. Andrew White on Jesus’ return. Hope is in short supply right now. Increased unemployment. Home repossessions threatening to hit 1991 records. Banks, the backbone of our economy, in turmoil. Many suffering fuel poverty as gas and electricity prices stay high, even when petrol prices have reduced. You know the rest. We could do with some hope. In the time of John the Baptist, Israel could have done with some hope. You’ve heard it enough times. In their own land, yet feeling like exiles, because they were occupied by Rome. Every now and again, someone popped up to offer hope in terms of an uprising. Every time, Roman legions quelled the rebels and executed them publicly. Well, you root yourself in another time when the people of God needed hope. The time addressed in Isaiah 40. Most of God’s people had been deported to Babylon, and had been there a few decades by this point. A handful had been left in Jerusalem. Then, a prophet in the Isaiah tradition turns up in Babylon, addressing the dispirited exiles and the desolate residents of Jerusalem. Using three metaphors from the physical world around him – wilderness, grass and mountains – he offers God’s hope to those lacking it and most needing it. And this theme of hope complements what we thought about last week, on the first Sunday of Advent. Then, our theme was waiting. Today, it is hope, which is the content of Christian waiting. Had we read to the end of Isaiah 40, we would have heard – depending on which Bible translation we used – about those who will renew their strength by either ‘waiting’ or ‘hoping’. So – without more ado – how does the Isaiah prophet help us to hope, using these images of wilderness, grass and mountains? Last week, as we considered the theme of waiting, we wondered how we live when it feels like God is absent. Isaiah 40 is bold in response to this: you may feel that God is not here, but God is coming! He gives us a picture that is a bit like the building of a new road (hopefully without the environmental concerns we have about such a project in our society). Prepare God’s way in the wilderness, make a straight highway in the desert, raise the valleys, lower the mountains, and smooth out the rough terrain, and you will see God’s glory (verses 3-5). So – in a time of God’s apparent absence, the good news is that God is coming. In a time of spiritual darkness, the good news is that you will see God’s glory. Music, surely, to the ears of disillusioned exiles in Babylon, and beaten-down people in Jerusalem. This is a message of comfort. Your punishment is over. Enough is enough (verses 1-2). We may not know when things will change for the better for Christian witness in our culture, but we can hear similar echoes of hope in Advent. Our waiting and hoping is for Jesus who is called Immanuel, God with us. God is coming. We are not alone. Christ is coming. Christ came. The Father sent the Spirit of Christ. Our sense of aloneness is only apparent. It is not actual. Of course, we must be careful: proclaiming that in Christ, God is with us, can make us sound like we have a religious superiority complex. This is not a matter of our deserving special rank. It is a matter of grace, God’s undeserved favour to sinners. The Son of Man came to seek and save the lost. It is not the healthy who need a doctor, but the sick. Jesus, God with us, came for lost and sick people – including us. Yes, God is with us in Christ. But we hold that knowledge humbly. And as we share it, we do so as one beggar telling another where to find bread. And the wilderness was specifically to be a place where God’s glory would be seen. Would God’s glory be seen in raining down fire and brimstone? No. It would be seen as he led a raggle-taggle bag of exiles back home. It’s a different kind of glory. It’s wilderness glory, a manger at the back of a house in Bethlehem, not a palace in Jerusalem. It’s the glory of God humbling himself into human flesh, one who later as an adult would not grant the wish of two disciples known colloquially as the Sons of Thunder, who wanted to unleash damnation on enemies. Yes, come to unexpected dry places like a wilderness – like a manger – and find that God is present in strange glory. Come to Broomfield and find him? Why not? When the prophet speaks about the people being like grass, I think he has wilderness grass in mind. It withers and fades in the heat of the wilderness, so when we hear about that happening when the breath of the Lord blows on it (verse 7), I think we’re meant to imagine that the Lord’s breath is hot and intense. The breath of the Lord, the Spirit of God, is not here life-giving but life-taking. The judgment of God had fallen upon the people with the Babylonian invasion and exile; now, like grass in the hot sun, they are withering and fading. The grass withers, the flower fades; but the word of our God will stand forever. Whatever happens to us, the purposes of God are not thwarted. Whether we wither due to divine judgment on our faithlessness or whether it is general oppression or persecution, hear the promise that ‘the word of our God will stand forever’. A story was told during the time when Russian communism ruled Eastern Europe. Soldiers raided the home of a Christian family and made some arrests. To humiliate them, they threw the family Bible on the floor. But a soldier noticed that one page didn’t burn. It contained the words of Jesus: ‘Heaven and earth will pass away, but my words will never pass away.’ That incident was key in the soldier’s conversion to Christ. There will be many attempts to destroy God’s word from its place in our society, and some of those attacks will focus on the church. But we are in Advent, the season of hope. The word of the Lord stands forever, and the gates of hell will never prevail against the church of Jesus Christ. None of this is a reason for complacency, but it is a reason for hope. Therefore, it’s here to boost our faith and fuel our prayers for God to renew his wonders in our day. So God is present in his strange glory, and he is speaking and will not be silenced. Those are grounds for hope, but they are not very specific. We need a vantage point. The herald, the preacher (who by the way is female in the text), needs to ‘get up to a high mountain’ to see things as they are and be several hundred feet above contradiction in preaching good news to discouraged people (verse 9). What good news? That God is victorious over the enemies of his people, that he comes in conquest, with his people as his booty, and with the gentleness of a shepherd caring for ewes and lambs (verses 10-11). Israel’s hope was the end of captivity in Babylon. The hope in Jesus’ coming was in his resurrection from the dead. Our hope, based on that resurrection, is that of God’s final victory when he appears again, not only to claim his own, but to renew all of creation, with a new heaven and a new earth. There are always reasons in the world to make us gloomy. At present there is a plethora of reasons. There are also reasons to be pessimistic about the western church. You would think there were few grounds for hope. But when you get up the mountain to see things from God’s perspective, the situation looks different. You see hope in the promises of God, who has acted decisively in the past, who will do so again, and who one day will make all things new. So let the world write us off. Let our friends regard our faith as irrelevant. Let Richard Dawkins describe religion as a virus. But see God’s view from the mountain: Jesus wins. Let that fill us with Advent hope. And while we’re on the mountain, let us – like the female herald in Isaiah 40 – proclaim it to all who will hear. Let us encourage one another in the church. Don’t be dragged down by the lies and limited perspectives of the world: Jesus wins. And let us also proclaim it to a world sorely in need of hope. To people who thought they could trust in money, until the banks blew up. To people who gained their sense of identity from their job, until redundancy hit. To people struck down with disability or chronic or terminal illness, whose lives had been based on the vigour of their bodies. To all these people and many others, proclaim that Jesus wins. It is promised in the actions of God and especially in the Resurrection. We have a hope worth trusting in. Why be afraid? Why be dismayed? You may recall I’ve said that my first circuit appointment was in the town of Hertford. There, the Methodists regularly quoted John Wesley’s Journal regarding several of the visits the great man made to the town on his preaching travels. They were fond of quoting one entry in particular, where Wesley was utterly discouraged. It said, ‘Poor desolate Hertford.’ Those words hung like a curse over them. But you may also remember how I have talked of being involved in ecumenical youth ministry in the town. Somebody gave me the complete set of Wesley’s Journal, and I looked up all the entries on Hertford. They weren’t all doom and gloom. Some were, but one in particular wasn’t. In it, Wesley recounted coming to preach at a school in the town. To cut a long story short, he saw a revival break out among the children. You can imagine the impact that story had on us as we gathered to pray about youth ministry. Never mind ‘poor desolate Hertford’. There was a heritage of Holy Spirit work among young people in the area. God had not been absent or silent. He had been gloriously present, proclaiming Good News. So I want to say that the Advent hope is like that. It is time to cast off the darkness. The great Advent text in Isaiah 60 says, ‘Arise, shine, your light has come’. This Advent, might we just dare to believe and to hope in our God? And might we find that in this hope we have something beyond riches to share with a world, whose own versions of hope have plummeted in value?